How Much Is ADT Pulse®? Home security services don’t have to break the bank. ADT Pulse® packages come equipped with wireless door and window sensors, a motion sensor, 24/7 professional monitoring, and mobile access. Plus, you’ll get industry-leading response times, time-tested technology you can trust, and options to add video surveillance and home automation features—all for a reasonable monthly price. Whether you upgrade to ADT Pulse® or to ADT Pulse® + Video, you’ll upgrade your peace of mind while saving up to $449. ADT-monitored security systems provide around-the-clock security monitoring from the #1 security provider in North America. Choose between two packages, each with 24/7 professional monitoring, remote arming and disarming of your ADT-monitored system, and text or email alerts from any of your web-enabled devices. And since ADT Pulse® includes CellGuard®, your system can connect with one of ADT’s six nationwide monitoring centers through your cell service instead of a landline. ADT Pulse® helps you simplify your life and feel more secure in the process. Not only can you control your security system from anywhere your cell phone works, you can integrate add-on home automation features—such as your smart thermostat, smart locks, smart garage door opener, and video surveillance. Keeping tabs on what matters most has never been easier. In an emergency, an extra minute or two could save the life of a loved one. For comprehensive protection when natural threats arise, ADT offers fire alarms, carbon monoxide detectors, and flood sensors—all monitored 24/7—to help keep your family and property safe. Fire alarms detect smoke and significant temperature increases, carbon monoxide detectors sense an excess amount of this noxious gas, and flood sensors detect a rise in water levels for protection you can count on. Since ADT representatives are at the ready around the clock, seven days a week, they are able to dispatch local authorities to your home even if you can't. When you upgrade to ADT Pulse®+ Video for just $6 more a month, you’ll be able to watch live video from your ADT Pulse® camera via smartphone, tablet, or ADT web portal. ADT Pulse® gives you not only signature monitoring services from the leading name in home security but also video features, which can increase your confidence in knowing exactly what goes on in your home while you're away. And most importantly, in the case of a break-in, video evidence may help the police pursue the suspect and the miss ing property more quickly. Forget to close the garage door or set the alarm on your way out? No problem. 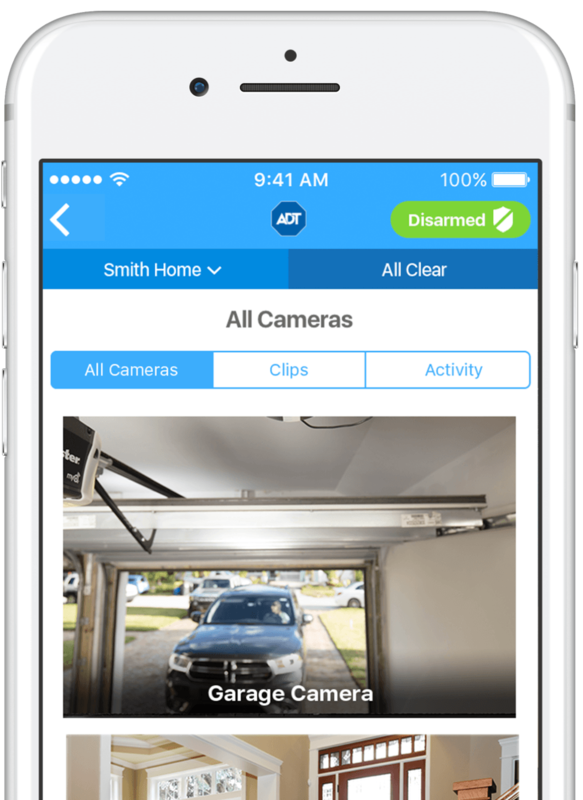 With the ADT Pulse®, you can remotely arm and disarm your system, check your smart door locks, close your garage, and even watch live video surveillance footage directly from your smartphone, tablet, or web portal. In the event of activity at your home, the app offers remote security text alerts so you can respond to the situation immediately. You can even customize what types of notifications your receive—such as an alert when your child comes home from school or a notification when a window is opened. Don't want to download another app? ADT-monitoring also offers a comprehensive text message alert service, available for all cell phones, so you're always just a text away from info on your home. Call 1-855-217-7604 or complete the form for a free quote.